The place where students of GMC's Online & Digital Design class (COM2011) post, share, and discuss examples of interesting web design. The San Diego Zoo has a fantastic website, that contains an international wildlife refuge, and is world renowned. It is more than a zoo, it is also a research facility. 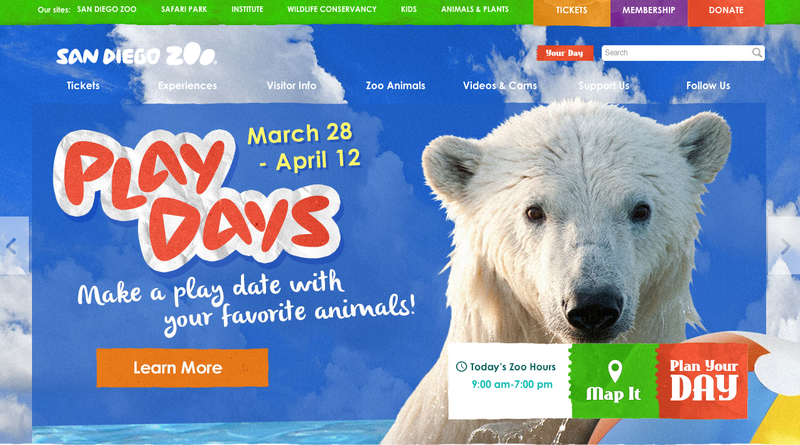 The websites purpose is to inform visitors on tickets, wild life experiences, and animals. On the website this information is presented through interactive wildlife, blogs, and educational videos. The target audience for this website is families with young children or anyone interested in animal studies. Based off of the reading in chapter 18 the strategy used in this website that makes it so successsful is presenting information in a unique way that helps visitors achieve their goals, and creating an attractive professional site. The design of the website helps the site deliver a message or drive the viewer to take action in many different ways such as card sorting, distinct, and visual hierarchy. After observing zoo.sandiegozoo.org numerous times I noticed that the site used the card sorting technique which helps decide which information goes on each page. I determined this by how well organized the site is and how easy it is to find information. The pages and headings appear to be in different styles which indicates that the focus was trying to make the page look distinct so that everything does not look the same and boring. Visual hierarchy delivers a message on the site. Key messages were focused and guided through very well. The design displays the target audience because it is very colorful and fun. When children or parents see this it gives them a welcoming and playful vibe that attractives visitors to want to continuing viewing the site and visit the zoo. The visual design itself is clear, functional and displays great structure content. The navigation is smooth and easy to follow allowing users to find information quickly and efficiently.